The 100 best companies to work for in Africa based on the results of 2018 Careers in Africa Employer of Choice Study. This was published in African Business Magazine. Alex Mugan the MD at Global Career Company, is joined by Matthew Mcdonnell and Yves Duhaldeborde from Willis Towers Watson to predict and discuss trends in 2019. Watch the recording of our live webinar on the topic Multi Generational Workforce in Africa. Leadership Pipeline Development by Innocent Oseghe. This is a follow up presentation from the workshop run by the CIPM at the Talent Agenda Series Conference in Lagos. The Talent Agenda Series is proud to launch our second webinar of 2018. Under the umbrella theme of Capacity Development, we will be discussing the importance of engaging stakeholders and assessing assets for human capital in Africa. Under the umbrella theme of Employee Engagement, we invited our Platinum Partners Willis Towers Watson to present on the subject, and introduce their new Pulse Software. What is the Talent Agenda Series and what do we hope to achieve through the upcoming conference in Lagos this April? Following the Talent Agenda Series Southern Africa Conference, which took place in Johannesburg in October 2017, we caught up with two of our fantastic speakers, Candice Watson, the Southern Africa Area Head of Talent at British American Tobacco and Loyiso Ndlovu, the Executive Manager : Strategy, Research, Policy and Marketing at Land and Agriculture Development Bank, to discuss their views on the changing environment in Southern Africa and what they thought the future held for the region. 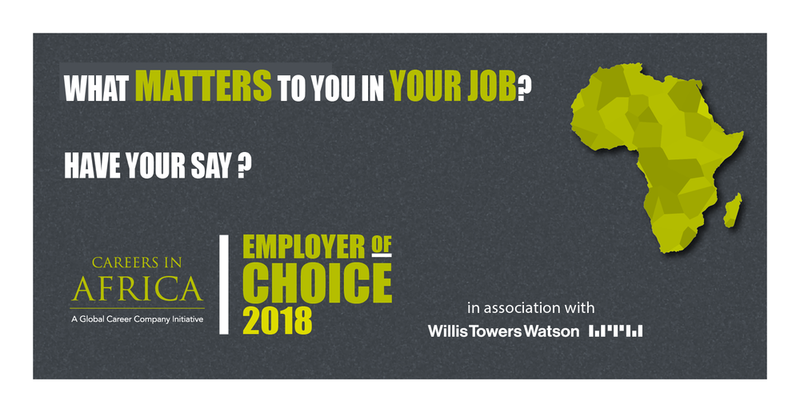 We are looking for members of our Talent Agenda Series Community to take part in our Careers in Africa Employer of Choice Survey 2018. Our initiative, Employer of Choice in association with Willis Towers Watson, is the biggest Pan-African employment survey featuring the view of African Professionals who work in the aviation sector and we would like to get our message to as many African graduates and professionals as possible. Careers in Africa Employer of Choice creates two-way engagement between top talent and great employers in Africa. We enable discovery and deeper understanding of African employer value propositions, providing a showcase for Africa's employer brands where talented African aviation professionals worldwide can find out more and interact. Through this survey, we would like to reveal what matters to African airline talent across the continent and around the world, as well as who the continent’s top employers really are. Revealed: What Motivated Southern African Talent? Based on the unique data gained through the Careers in Africa Employer of Choice study, the webinar explores ways of creating and leveraging an employer value proposition (EVP) to attract, engage and retain the right talent pool for your business – based on what Southern African professionals really want. Employer Brand and Charities: What can this do for your company? We were lucky enough to sit down with Camilla Leeds, Tobias Becker and Nigel Bastow to discuss the importance of Leadership Development and the challenges faced by employers in the Southern Africa region. We joined Dr Jerry Gule, Precious Murena-Nyika, Cebile Xulu and Sarah Roe at the Talent Agenda Series Southern Africa conference in Johannesburg 2017 to discuss gender parity in the region and the best ways organisations can promote a healthy balance in their business structures. I have asked Rupert Adcock, the CEO of Global Career Company, a few questions surrounding the role of Leadership Development and its effect on employee’s and a business as a whole. Kenyan Elections - What do they mean for the region? We sat down with Tara O'Connor, CEO of Africa Risk Consulting, to discuss the latest developments of the Kenyan elections and what the consequences are for the region. The number of awards and honours given to this Zimbabwean powerhouse is testament to Precious Murena-Nyika’s prestigious professional career. Find out more about Precious below.